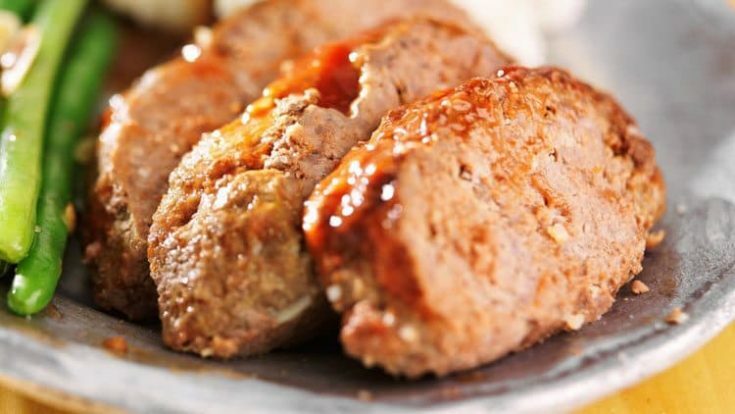 This recipe for copycat Cracker Barrel meatloaf makes a ton, so if you’re not feeding the troops, you either want to reduce the recipe or use this as a freezer cooking recipe. This recipe freezes wonderfully. Not familiar with freezer cooking? If you are just getting started, you will want to stock up on freezer cooking containers, one of our favorite freezer cooking cookbooks, and clean out your freezer. It really does help to start out with a clean freezer if you are going to do large scale freezer cooking. Like I mentioned, this recipe makes a ton. 42 servings, in fact. 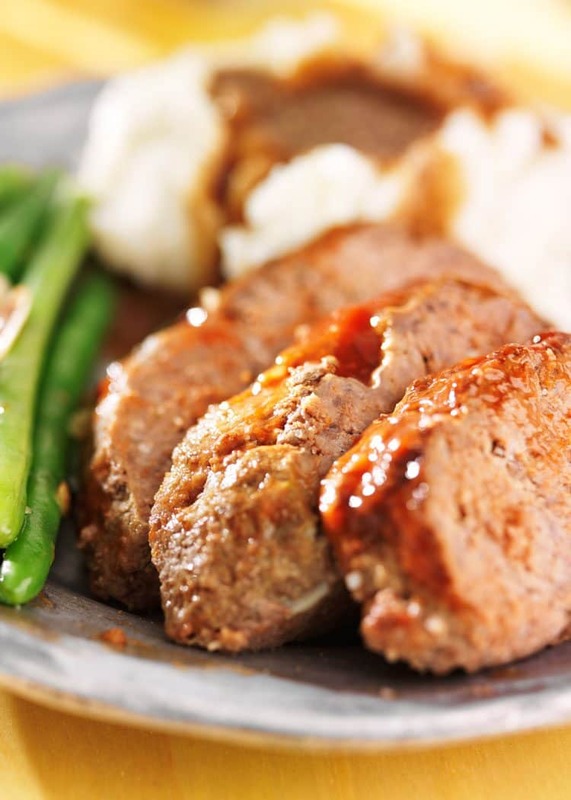 Since our family LOVES meatloaf, mixing up an entire recipe and divvying it up into three complete meals is a no-brainer, and a time-saver. True–freezer cooking is not for everyone, but it is a great way to cut out some of the processed and fast food from your family’s diet and eat a bit better along the way. If you’re making up all 3 loaves of meatloaf, go ahead and get 3 meatloaf pans ready. Using loaf pans that are specifically designed for meatloaf is so much easier, because the meatloaf can be lifted right out–perfect for slicing. It’s unbelievably simple. When you decide to make meatloaf, you’re pretty much invested in making a delicious home-cooked meal. 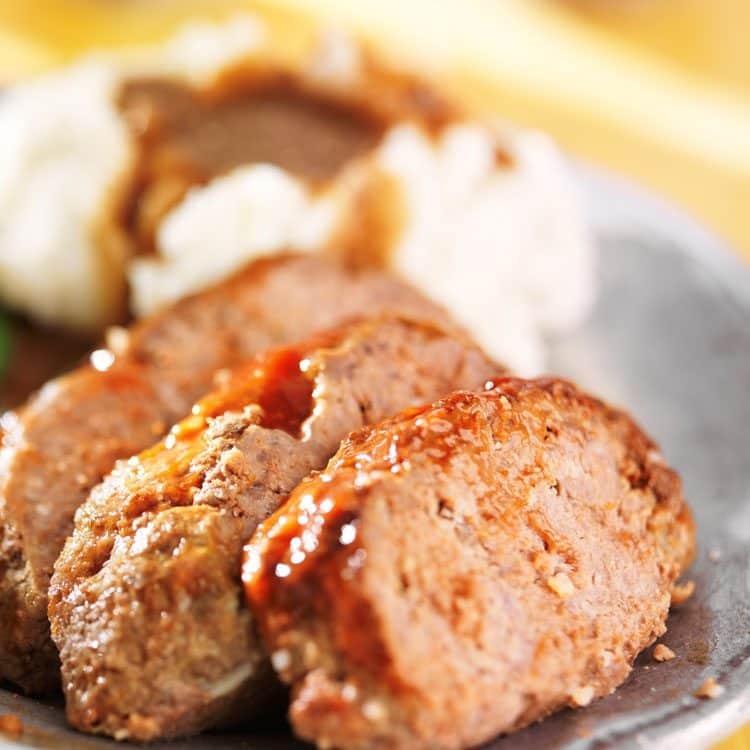 We like to serve meatloaf with either Southern Mashed Potatoes or Garlic Mashed Potatoes. Both of these potato dishes are classic in flavor and compliment meatloaf to perfection. Another good bet is Grilled Asparagus or an Italian Chopped Salad. We’re talking about veggies that are simple and crisp, that will let the meatloaf be the star of the meal. Want to eat out instead of making meatloaf at home? Or give the gift of a Cracker Barrel gift card? You can find Cracker Barrel locations near you and even take a look at the Cracker Barrel menu before you go. It’s always a nice idea to get a good feeling for what you want to order before you go…especially if you have any type of special diet to consider. Looking at the Cracker Barrel Nutritional information is the place to find the answers to any questions you have about calorie count, diet restrictions and nutritional value. This copycat meatloaf recipe makes a ton, so you can put a couple loafs into the freezer to enjoy later. Mix ground beef, onions, green bell peppers, eggs, salt, pepper, tomatoes, and biscuit crumbs completely with gloved hand in large bowl. Divide into 3 loaf pans, pressing down with spoon. Using a convection oven, bake at 300 degrees Fahrenheit for 60 minutes. Remove loaf pans from oven. Invert each loaf over 8-inch wire rack to drain grease and juice. Top each loaf with 1/2 cup of catsup. Slice into 5 to 6 ounce portions and keep warm until ready to serve.